As a skincare fanatic, I love trying new products out, and my favorite item of all is serums! 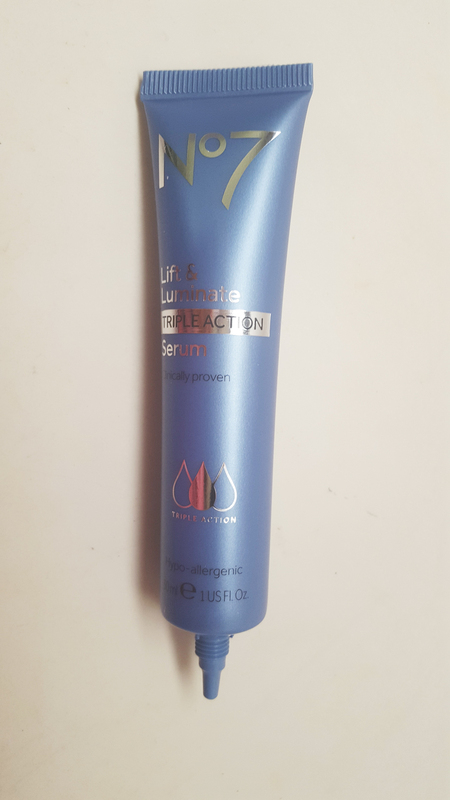 I had a chance to test out No7's brand new Lift and Luminate Triple Action Serum. If you're looking for a product to help even out your skin and reduce wrinkles, check it out! Apply the serum right after cleansing your skin. Apply 3 pea sized pumps into your hand, and then apply on an upward motion. The serum absorbs very quickly. Then apply your moisturizer. This product has tons of amazing ingredients - Collagen firms the skin, Hylauronic acid helps retain moisture, and the lightening complex will even out skin tone and fade pigmentation. The product claims that after two weeks you'll notice your skin looks more even, lines look smoother, and your face overall feels smoother. I love the squeeze tube container. It's small, travel friendly, and sanitary. As far as the product goes, as soon as I applied it I loved it. It's super silky and hydrating. Most other primers I've tried are very light and liquidy, where as this has more of a silky feeling. I like it! I noticed that my skin felt instantly moisturized and I have very dry patches. The product is geared for ages 35 and up. I didn't notice a huge difference with wrinkles...but I do think my skin feels softer and looks more radiant. I'm a firm believer in preventative face care...and i'm coming close to the 35 mark I'm all about preserving my skin as long as possible and preventing wrinkles and sagging from making an appearnce. I love that this is a high end product but easily available at your local beauty aisle. You can find this product retailing for $33.99 at Target, Ulta, and online.